As time passes, and the older I get, the more I am appreciating the little things. It used to be when a holiday rolled around I might have moved quickly from swimsuit to Christmas sweater, but now I’m realizing that subtle touches can be enough. The same is true with my home. There was a time where my home looked like “Elf” had snuck in during the night and bedecked it with cheer galore! Now I’m drawn to a more simple reflection of the changing seasons. 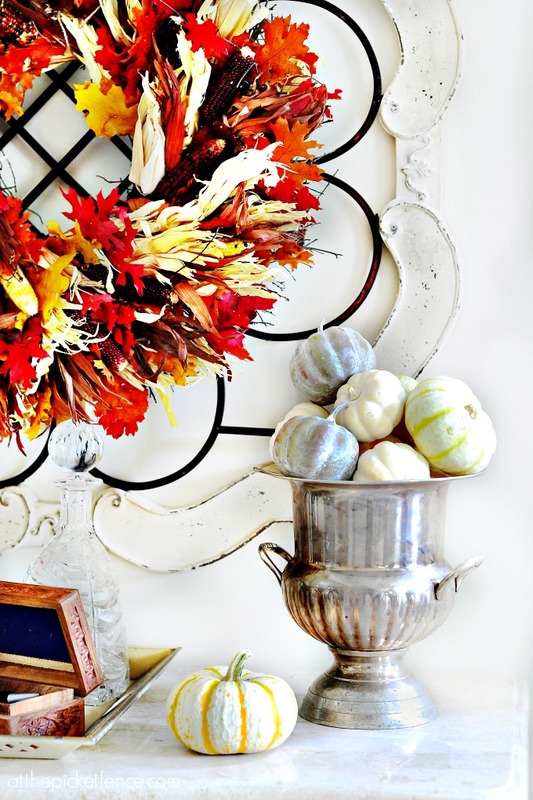 This year I am loving using simple reflections of autumn, as I pay homage to my favorite season! 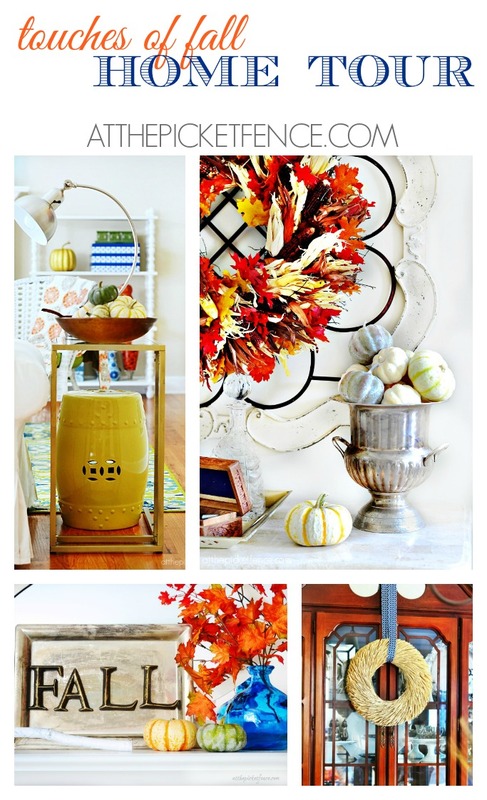 I hope you enjoy these touches of fall as well! Once again this year my House Number Pumpkin Topiary is greeting guests at the front door! 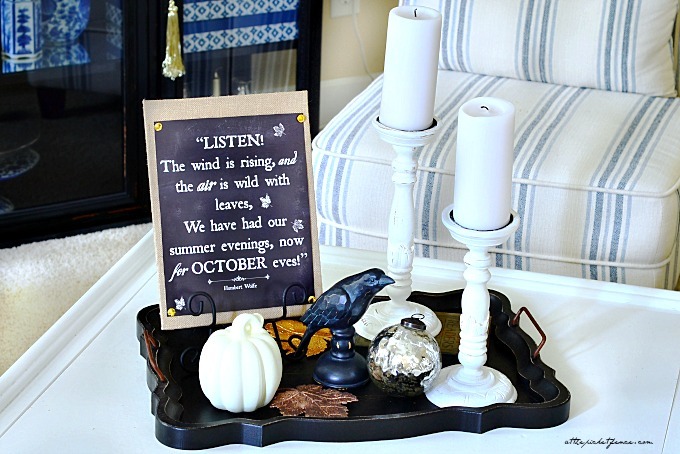 You can get download and print this Chalkboard Fall Printable for yourself! 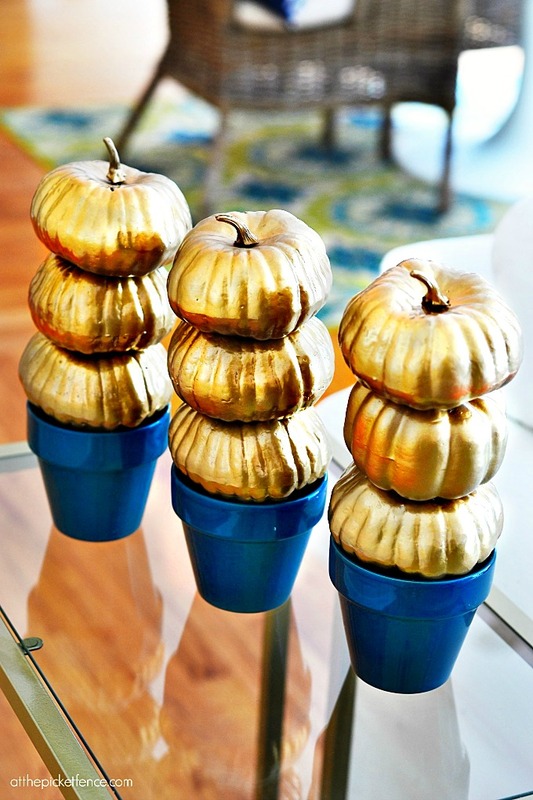 I love little touches like mini pumpkins piled in an tarnished vintage silver trophy. 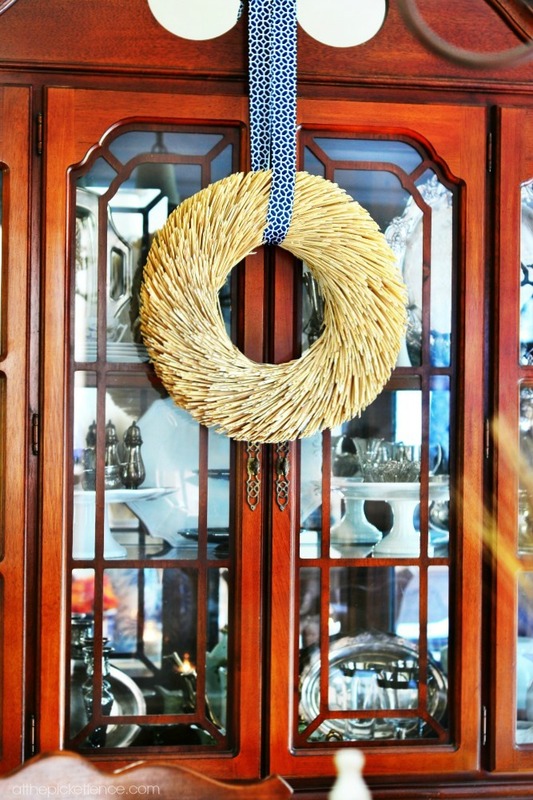 A simple straw wreath tide with a modern blue and white graphic ribbon is perfect for a dining room hutch. 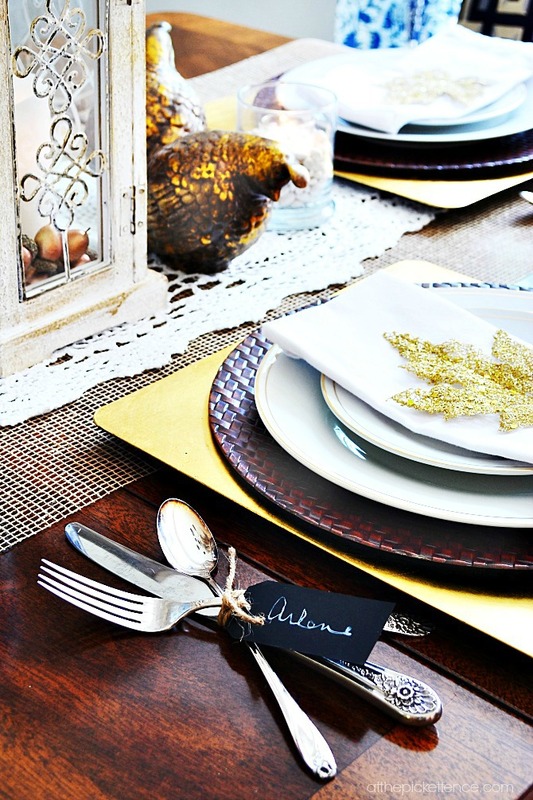 I love the simplicity of family silver tied with chalkboard name tags and twine. 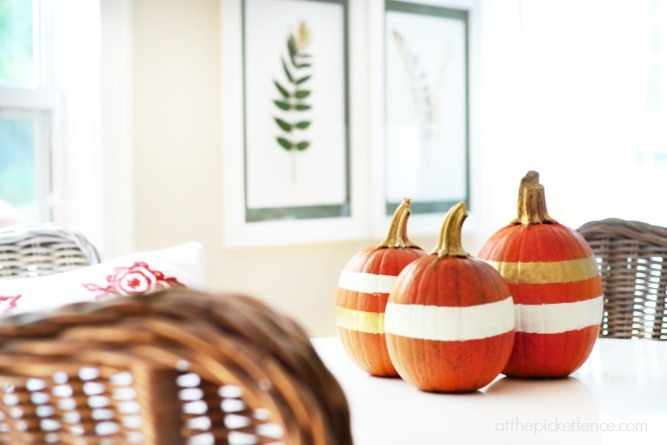 A trio of striped gold and white pumpkins makes the perfect centerpiece for our breakfast table. With the addition of pillows and blankets we can snuggle up while playing a game of cards. 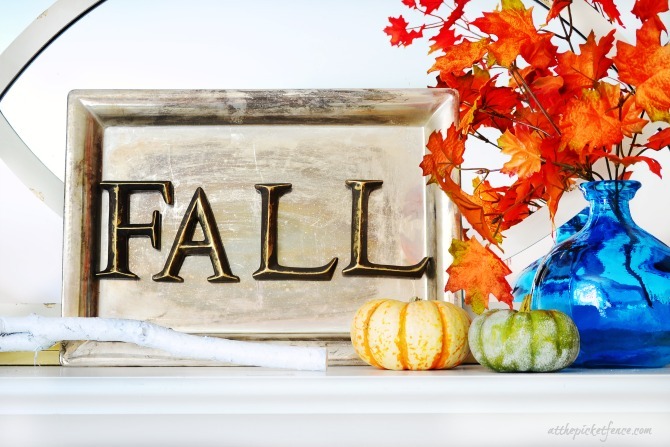 Magnetic letters spelling FALL on a vintage silver tray makes a great statement. I love this fun retro looking fall pillow from my friend Vicki of Curly Willow Designs! Doesn’t it match perfectly?! 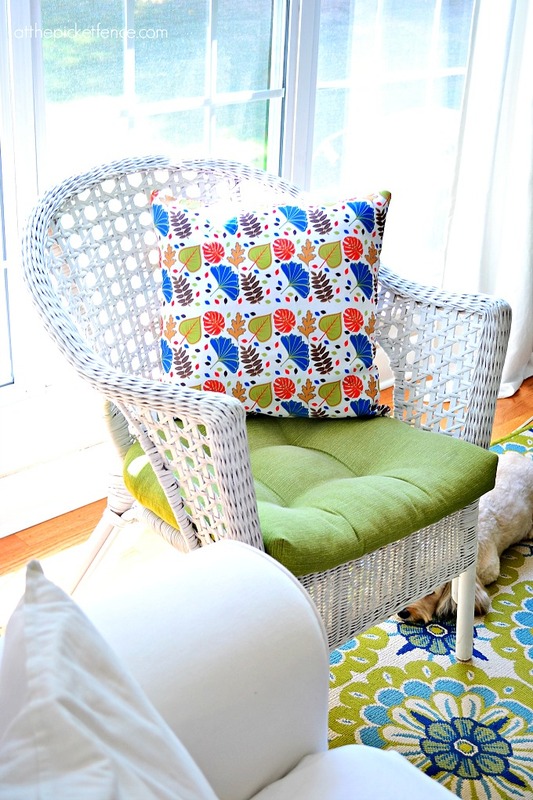 She creates the most gorgeous vintage inspired prints, tea towels and pillows! I do have to admit though, that our favorite spot in the fall is right here…. Hanging out with family and friends around our fire pit, enjoying s’mores, cider and friendship! 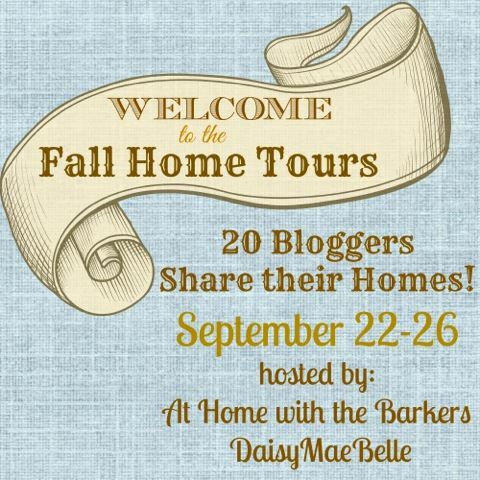 Be sure to stop by So Much Better with Age, Setting for Four, Liz Marie Blog and Two Thirty Five Designs who are also sharing their gorgeous Fall Home Tours with us today, and be sure to visit At Home with the Barkers and DaisyMae Belle for the compete home tour schedule! 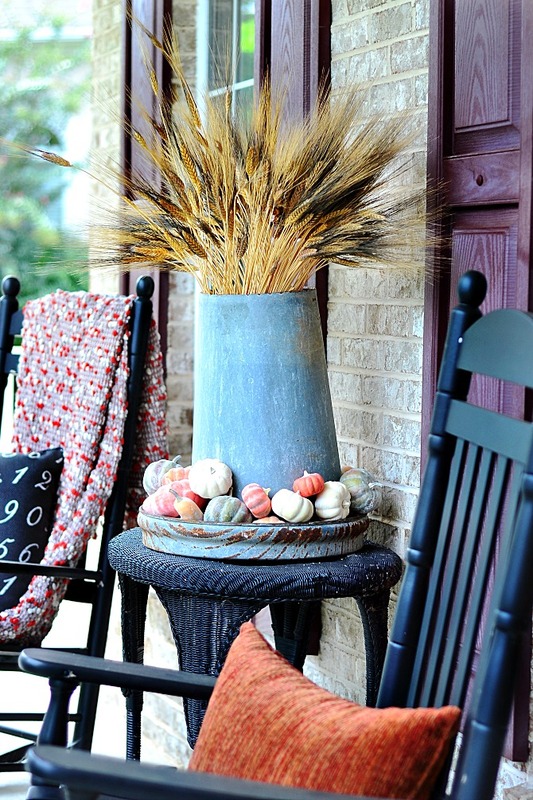 33 Comments on "Touches of Fall Home Tour"
Everything looks fantastic, I especially love the porch decor. Heather, everything is pretty . I am sure you are enjoying all the seasons in your beautiful home. 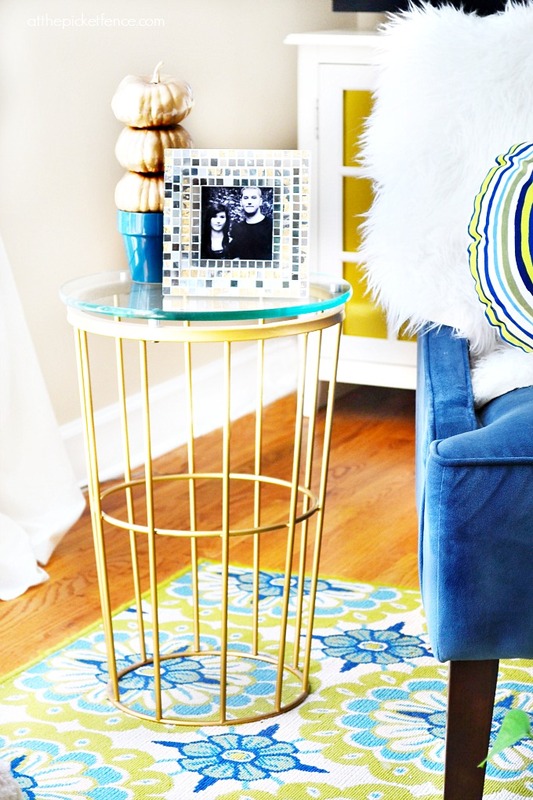 I knew that pillow would look amazing in your house!! GAH! Love it and love you for sharing! Excited to see you and hug on you in a few weeks!! In this case simple is perfect. Everything is beautiful. Happy Fall Heather! Gorgeous. 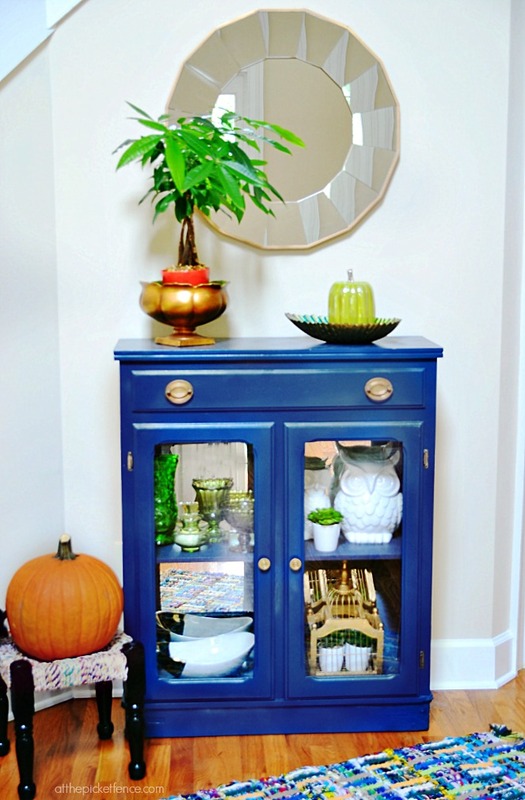 I love how well you use blue in your home and it doesn’t look blah. You manage to add so many other colors and it just makes everything pop. Love the house number pumpkins too. So fun. 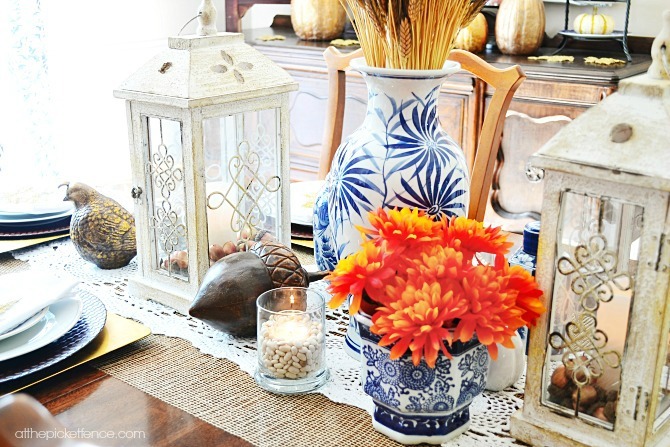 Your Fall touches look beautiful Heather…your dining room table is my favorite!! Such gorgeous pictures! Last year I really minimized my Christmas decorating. I’m not sure if it was being lazy or just enjoying the simplicity! 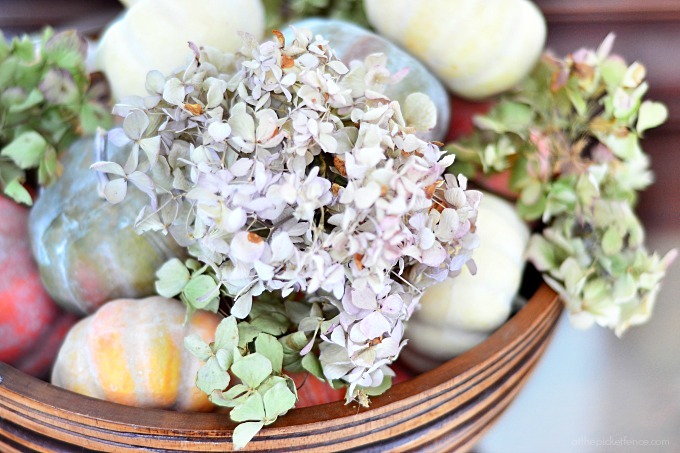 Your touches of Fall are so pretty! 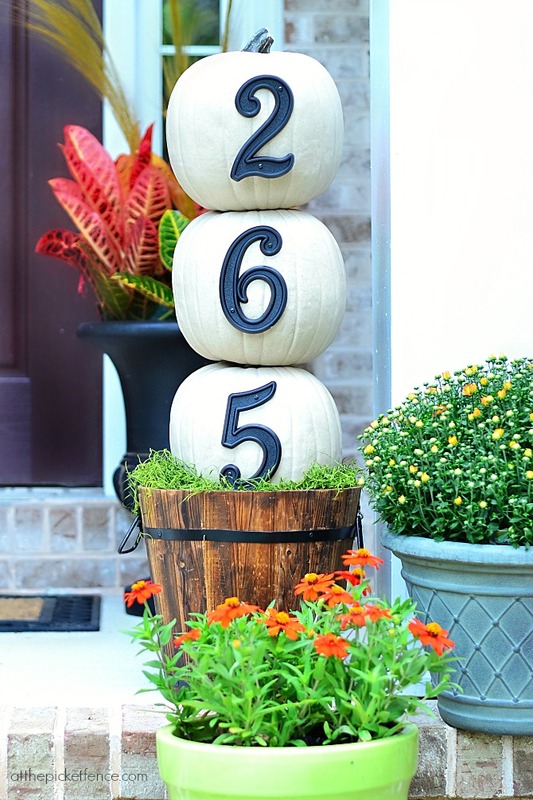 Love the mini pumpkins and the pumpkin house numbers! Beautiful photos. 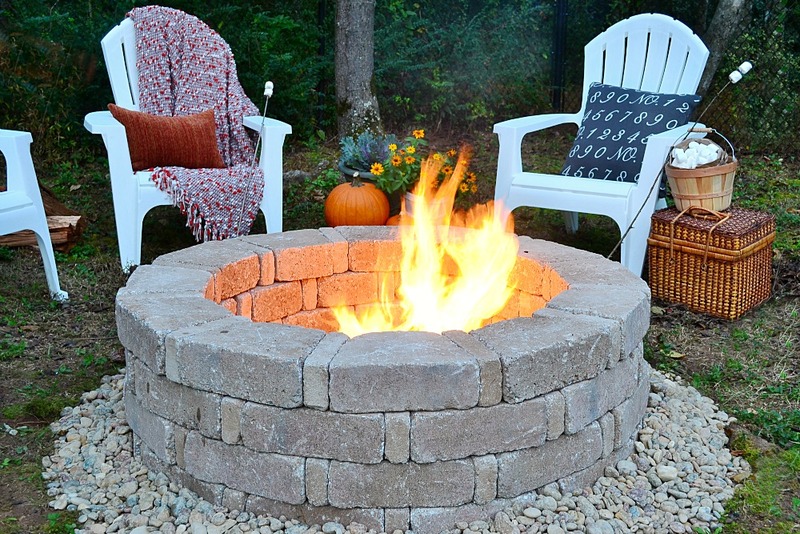 Certainly me in the mood for Fall, especially the gorgeous fire pit! 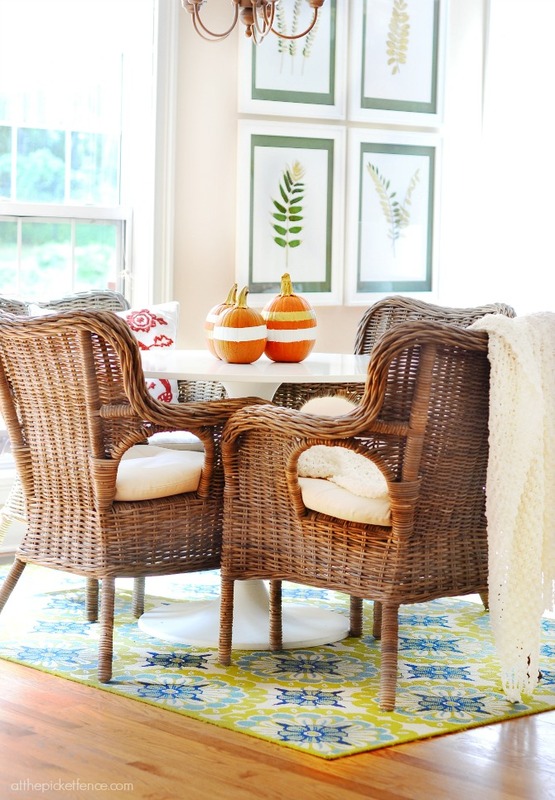 Love the pumpkin topiaries and all your fall touches. So beautiful! So beautiful, Heather. I love the cozy outdoor seating area. I can hear the wind blow, and see fun conversations over a cup of hot apple cider. YUM! It’s all so pretty Heather! Simple and stunning at the same time. So fresh & fun! Love it all!! Happy Fall & HAPPY FRIDAY!!! I’m on my way over with a smore kit to visit you by the firepit – hey that rhymes lol!! 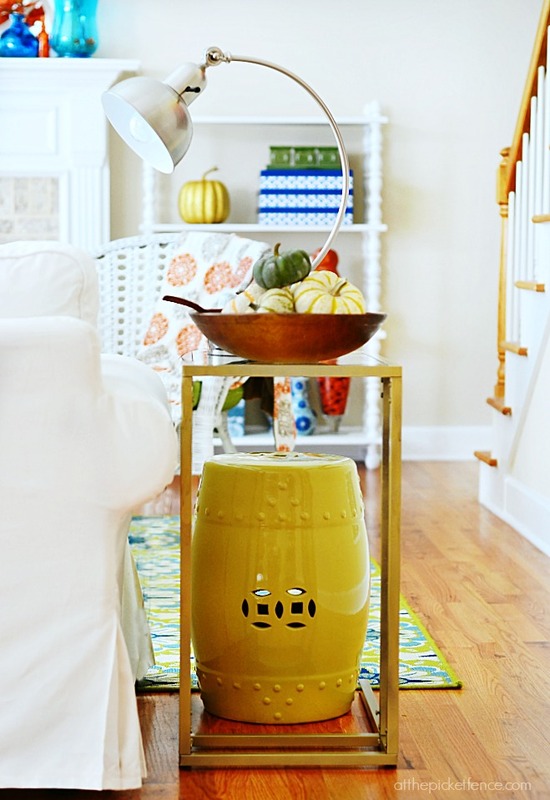 I love your home Heather – so amazing how much you’ve decorated since you moved in! Stunning! Gah! 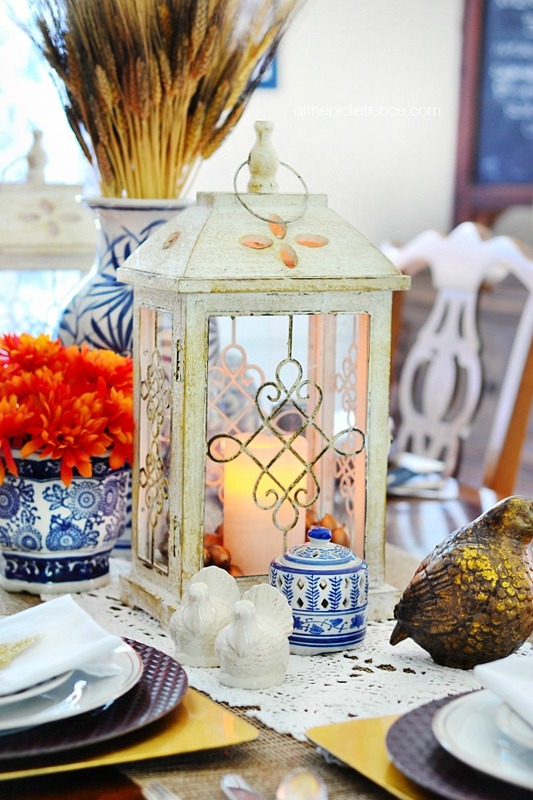 I love the way you guys mix a rustic/vintage feel in a modern way. And it never comes off as too girly, which is something I have such a hard time doing myself. Thanks for the inspiration to keep trying!!! This is my new starter blog that is just a little, bitty baby.